Her favorite things to do are play tug, prowl her yard and clear the deer. She plays well with her furry and human family. She keeps us alert to ANY noise she does not like but will welcome people with enthusiasm. She’s cautious of other unfamiliar dogs…her weakness. I love her to pieces! She will make a wonderful companion for you for many years to come - so good luck with her and keep sending in the photos. We always love seeing all our readers German Shepherd photos and hearing all about your own GSD stories! I Think your GSD is stunning! She reminds me of my friends dog she used to have when we were at school, she was beautiful too. I am getting my first GSD in November on Bonfire night to be exact. I can't wait. It's a total surprise for my daughter who is dying for one and has been for some years, so hope she will like the surprise. "My First German Shepherd Puppy, Sophia"
Your Sophia is a Beauty and she is so big already! 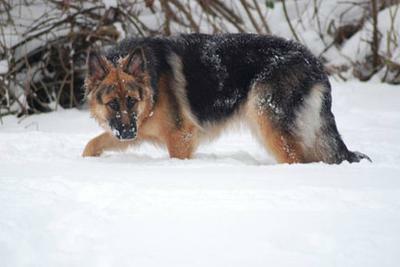 German Shepherds are amazing and Protective, Loyal, Trustworthy and Obedient (most of the time). We feel the same way about our Mia who is 3 yrs old. Take care of your girl and she will take care of you!